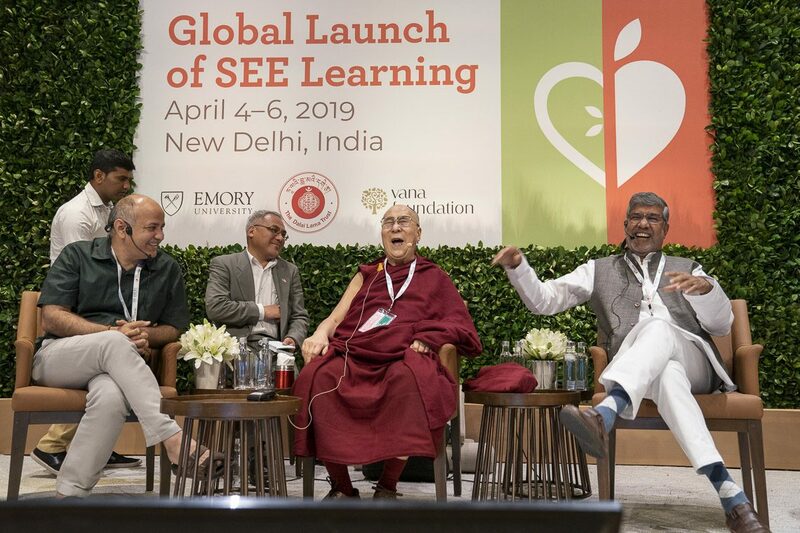 (TibetanReview.net, Apr06’19) – The Dalai Lama has on Apr 4 presided over the media launch of a programme called Social, Emotional and Ethical (SEE) Learning in New Delhi. It was inspired by the exiled spiritual leader of Tibet and jointly launched by Emory University (USA) in collaboration with the Dalai Lama Trust and the Vana Foundation (India). The Dalai Lama also presided over the programme’s launch conference with other participants who were stated to include Dr Daniele Goleman, psychologist and author of ‘Emotional Intelligence’, from the University of Illinois; Miss Linda Lantieri, who is associated with SEE Learning as an educational consultant; and Dr Kimberly Schonert-Reichl. It was moderated by Mr Brandon Ozawa De Silva, associate director for SEE learning centre at Emory University. Presenting an overview, Mr Brandon has said the programme was launched for the realisation of the Dalai Lama’s vision for holistic education for mind and heart. “A happy world cannot exist without human compassion, therefore, education system should include the education of warm-heartedness,” the Dalai Lama was quoted as having remarked. He has said much of the world’s problems are created by human beings because of their lack of control over rising emotions and anger and such problems cannot be resolved by mere prayers. Dr Daniele Goleman has spoken about the impact of the learning programme on students’ social and emotional skills. He has said skills adopted by the learning programme had greatly helped students dealing with violence and abuses into making good decisions. He has said the combination of wisdom and compassion is exactly what the world needs now and in the near future. Miss Linda Lantier has described her own experience to say the programme digs deeper into the education world, focusing not only on educating the mind but also educating the heart and spirit as well. She has cited an example of her experience with a student under the programme who showed that the skills and knowledge learned through the programme had indeed made an impact. Brendan Ozawa de Silva has said the programme was the result of a 20-year collaboration with His Holiness. At the main sessions of the SEE Learning global launch programme on Apr 5, the Dalai Lama told an audience of more than 900 educational and policy leaders from around the world that the results of the curriculum would not be seen in immediate future, but that the next generations will surely see more compassionate human beings, happier individuals and families. Other key speakers included Deputy Chief Minister and Minister of Education, Delhi, Manish Sisodia; Nobel Peace laureate Kailash Satyarthi; Dr Lobsang Tenzin from Emory University and others, including Veer Singh from the Vana foundation and Tempa Tsering, Director of the Dalai Lama Trust. Over the years, more than 600 educators in various countries have attended SEE Learning workshops, with a high school curriculum being planned for 2020.